Say the name Journe, and many watch enthusiasts will get instantly excited, as the Master-watchmaker from Geneva has built an impressive reputation based on equally impressive watches. It is however not always the complications that do the talking, as this Chronometre Souverain shows. The Chronometre Souverain oozes classical elegance, yet with a twist that is typical Journe. It starts with the somewhat unusual shape of the hands, as well as the location op the subdial for the seconds and the power reserve indicator. 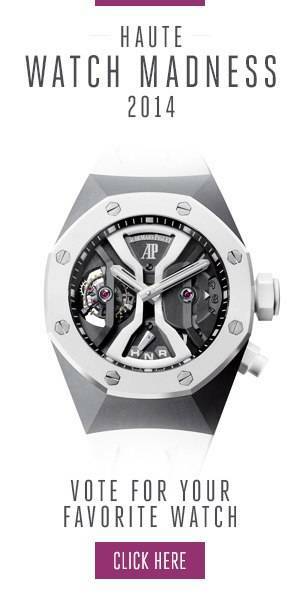 The design is very thought through and subtle, not to mention surprisingly balanced for an asymmetrical dial. It gives the watch a slightly more contemporary look and sets it apart in a subtle way from offerings by other brands. While its understated yet exclusive looks might be one reason to treat yourself on a Journe, it is most likely the movement that made you pull the trigger on purchasing one. In fact, it wouldn’t be surprising that you would spend more time examining the movement once you have your watch, then anything else. Part of the appeal is that it is crafted from 18K rose gold. In the world of high-end watches, even ultra-high end watches, this is a rarity. A pity actually, as it looks so stunning, giving the movement a very rich look. It is not only the use of 18K red gold that does this but also the considerable skills of Journe and his team. The finishing, from the engine-turned surfaces to the Geneva stripping and the hand chamfered edges of the bridges, are all perfect. The movement itself is manual wind and fitted with two mainspring barrels. They work parallel to provide the rest of the movement with a constant and stable power supply, to increase its precision. An interesting detail is also that the power reserve indicator works reversed. When fully wound the hand will bet at the “0”, and when it is empty it will be at “56”. This sounds strange but makes sense as it indicates not a number of hours left in the movement, but the number of hours passed since you last wound the watch. The Chronometre Souverain is available in 18K red gold, or platinum, on either an alligator strap or 18K red gold or platinum bracelet. There are two dials available for the Chronometre Souverain, a guilloche silver dial, and the newer one, as shown here in the images, with the applied Arabic numerals in gold.